“We’re like birds on a branch, wondering when to fly,” says a Trappist monk to his Muslim neighbor. This is a village in the Atlas Mountains in the nineties, Algeria is just beginning to erupt in war, and his monastery is at risk from fundamentalist guerillas. At their remote monastery, the monks in Of Gods And Men make honey, keep sheep and goats, grow their own food, tend their Muslim community life with a daily clinic, and attend local Muslim ceremonies, as their order has for wel over a century. In one touching scene, Brother Luc is asked what falling in love is like by a girl. “It’s like something comes alive inside of you …” And yes, he then adds, he has been in love himself, and several times too-but now he’s found a greater love, and a better life. And now this simple life of service and prayer is ending in a dilemma. 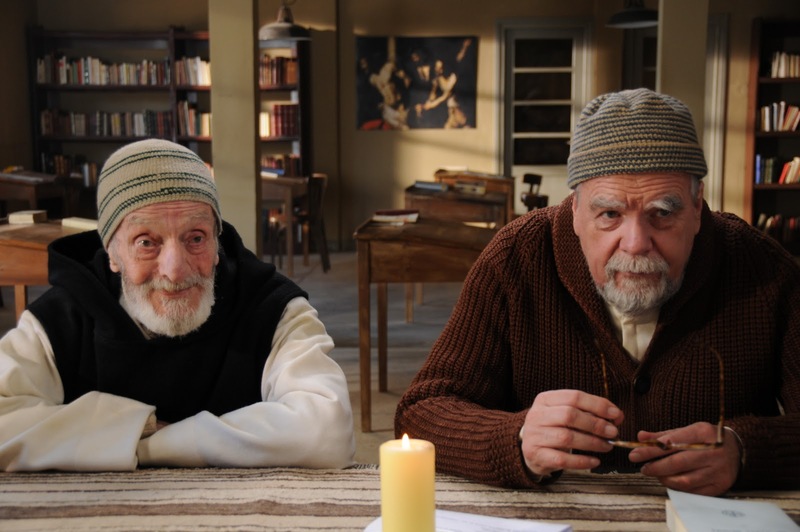 The monks are caught in the crosshairs of the Muslim insurgency that has slaughtered foreign workers, taking the mountain village hostage, and now needs their clinic with its monk-doctor, Brother Luc (Michael Lonsdale, in a subtle, moving and masterly performance). Much has already been said about the lovely singing of the monks, of their brotherhood as men, and the beauty of their manly old faces. We are left in no doubt that Of Gods And Men was a profoundly bonding experience, and that its calm exterior and long scenic shots intensified the horror of its ending. So should they go? The local police and bureaucrats say yes, urgently, adding helicopter surveyance to the harrassment. The monks – a group of seven assorted men under austerely intellectual Brother Christian (Lambert Wilson) debate the crisis repeatedly. Finally they stay, despite the risk. It’s no accident that as they eat in silence they come to resemble the Last Supper. The accompanying “Swan Lake” track is an obvious hint to what is to come; we know what they face, and their distress. But by not leaving, the brothers stand firmly together in the interconnected community, and this very strong image of human brotherhood is what we take away. By the end of the film, when the monks link arms in prayer, the implicit message is that their values are tolerance, selflessness and decency in the teeth of indecency, and they triumph. Slow of pace and often silent, striving for the same simplicity as the monks, inexorably grinding towards a bloody ending in the mountain snow, Xavier Beauvois has made a quasi-documentary of an intense experience and it’s unsurprising that Of Gods and Men won the Ecumenical Prize at the 2010 Cannes Film Festival. It’s also a prolonged meditation on monastery life and the nature of good and evil and martyrdom in the face of unprovoked challenge. Beyond leaving or staying, should men remain passive in this situation or leave? Is it real passivity in this instance, and is it moral? These intellectual issues of violence countered by non-violence are what the monks grapple with, and they do so courageously, if not a little blindly. But mostly what we take away is awe and an insight into a secret world most of us do not know, and that without this could have never seen.